Instead of attending a boring party where you do not know anyone, plan a house party where your friends will be invited. You can plan a unique dress code and make your place spooky using some scary items. Apart from that, you can prepare some unique dishes to impress your guests. How to use wristbands: You can customize glow-in-the-dark wristbands and write a scary message on them. After that, these wristbands can be distributed to the guests. Watching scary movies on Halloween is one of the best things to do this 31st October. Collect some scary movies and invite your friends to watch them with you. You can decorate your place to make it spooky and scary. How to use wristbands: You can design many wristbands in the same color and a message to distribute them to the guests. They are a valuable accessory when there is a theme for the event. You can plan to organize a dress competition for Halloween 2018. You can select a theme or ask people to design their own outfit. To an individual with the most unique dress, you can give a prize. How to use wristbands: You can customize some silicone bracelets to give them to people attending the contest. Apart from that, glow-in-the-dark wristbands can also be given at the end of the event as a ‘thank you’ gift. 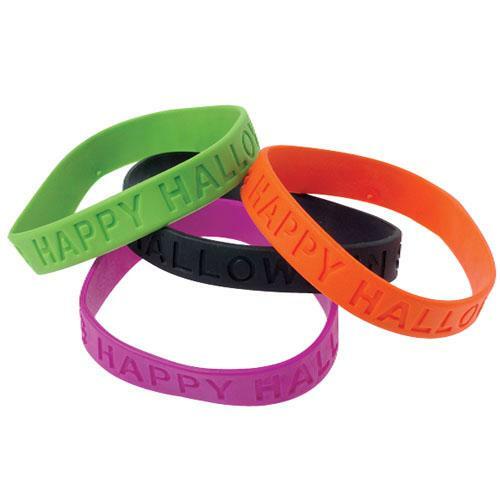 Whether you want to customize only a few wristbands for Halloween 2018 or your plan is to purchase many of them, get them from Make Your Wristbands. There are many customization options at the online store to fulfill your requirements. All the wristbands are inexpensive and can be customized as per the need. Visit the ‘Start Designing’ section to design your own wristband now.